It was January 26, 1778 when Captain Arthur Phillip raised the British flag for the first time on the island continent of Australia in Sydney Cove. This day is celebrated each year as Australia Day. However for the Aboriginal people, whose roots date back some 50,000 years, they call it a day of mourning, or Invasion Day. I imagine the Aboriginal people felt much like Native American Indians did when the white men showed up on their land in North America. Australia’s independence from Britain was January 1, 1901. The people of Australia are mostly of British descent, with some Asian and Native Aboriginal minorities. To dispel a myth, Aussies are not all descendants of convicts. Europeans, mainly British and Irish, came to Australia’s beautiful coast of their own free will. It is true the land was used as a base for convicts but certainly not for the majority of immigrants. Since the early days of colonization, migrants from all over the world have enriched almost every aspect of Australian life. Australia is wealthy and large; nearly 3,000,000 square miles. It is surrounded by the Pacific and Indian oceans in the southern hemisphere and often called “The Land Down Under.” Australia has vast resources and exports many products such as coal, iron ore, gold, diamonds, beef, wool, mutton, fruits and wine. She produces over ninety percent of the world’s opals, which is their national gemstone and happens to be my birthstone. In Aboriginal legend, the opal was a gift from the sky; a rainbow that touched the earth and created the magical colors of the opal. Australia is also home to 19 World Heritage sites, including the breathtakingly beautiful Great Barrier Reef. The world’s largest stretch of coral reef, located just off the north eastern coast, is home to about 400 types of coral and forms a critical habitat for many endangered species. It provides for plentiful diving and reef walking in its crystal clear waters. English is the official language of Australia however they do have some unique ways of expressing themselves. I guess you would call it local color. “G’day Mate,” is a sincere greeting from an Aussie and matesmanship is taken very seriously. Although we have heard the term “Throw another shrimp on the Barbie” that is not a typical saying in Australia. I picked out a few slang terms to share that I found kind of fun. Here you go. Bag of fruit = a man’s suit. Can you imagine, a man in a suit walks into the office and someone says, “Wow, nice bag of fruit!” Bob’s yer uncle = If you do this, it will be better. For example, “Just add some extra water and Bob’s yer uncle.” Bob must have been some really special guy. Full as a goog = drunk or one who has eaten to excess. For example, “That was a great meal, I am full as a goog.” There are so many more, it is very entertaining to Google “Australian slang” and have a few laughs. I would definitely read up on their expressions before a visit there. 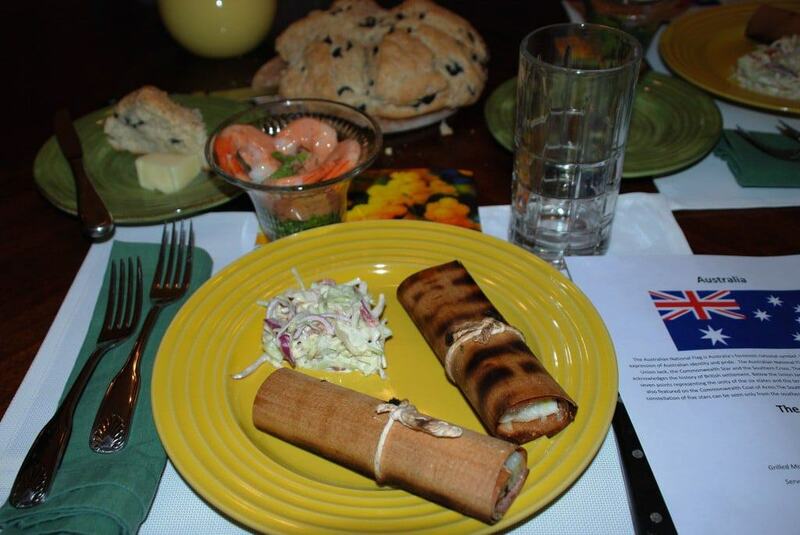 Speaking of a meal, the main culinary influence is clearly British and Irish. Some examples of their dishes are fish and chips, lamb leg roast, snags (sausages) and tomato sauce. I was shocked to learn that Australia has a higher obesity rate than the United States. How could that be with all those beaches and active outdoor living? Then I got, it ….meat pie. It is Australia’s national dish, typically served with mashed potatoes and gravy on top of a thick pea soup. I was going to choose this as the International Cuisine meal until I looked at the calories per serving. With 1200 calories in just one slice of pie, I decided to pick something a bit easier on the waistline. There has been a resurgence of interest in what is known as “Bush Tucker”. The indigenous Australians who have occupied the lands for thousands of years developed a unique hunter – gatherer diet. They may know a thing or two about healthy eating. Berries, bugs, grubs, kangaroos and crocodiles are standard ingredients. You can find some of these specialties in the local restaurants. Today every type of cuisine can be found in Australia; it is a multi-cultural nation. Fresh produce is readily available, with a strong emphasis on organics. 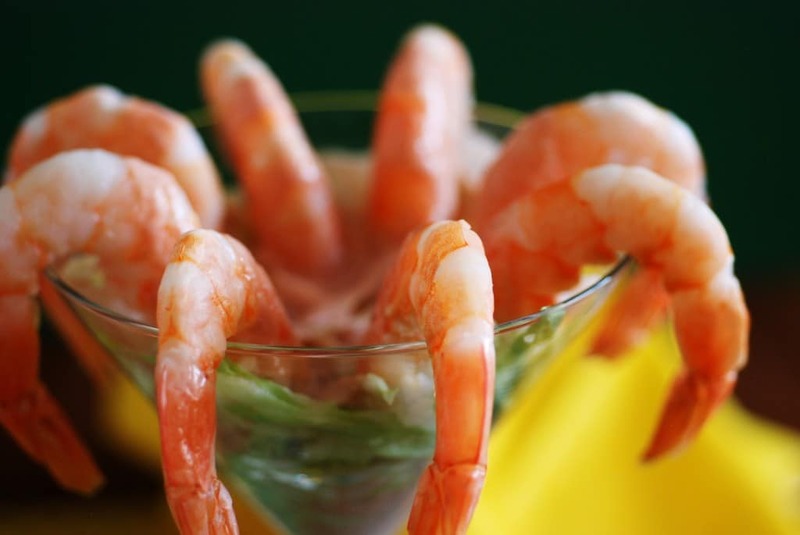 As many Australians reside on the coastline, fish and seafood are extremely popular. I also have to mention Vegemite. Australians love this stuff. It is a dark brown food paste made from leftover brewers’ yeast extract with various vegetable and spice additives. Just like in the song Men at Work made popular “The Land Down Under” one of the verses goes like this, “I said do you speak-a my language? He just smiled and gave me a Vegemite sandwich.” So it is a spread for toast or crackers. You will either love it or hate it. 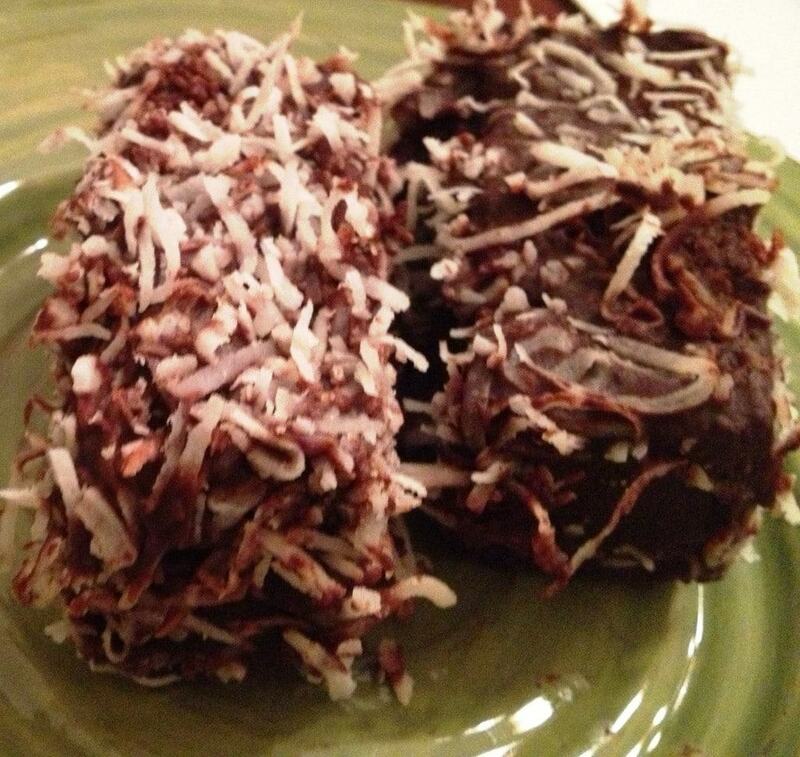 a little sponge cake coated in chocolate and grated coconut. A traditional Australian treat! We set the table using the national colors of Australia which are green and gold. These colors reflect Australia’s landscape, principally due to the Golden Wattle, which is their national flower. The appetizer, prawn cocktail, was very reminiscent of a regular shrimp cocktail, although the sauce is made with tomato sauce and cream. It was quite lovely. The main course of Barramundi was the real treat for me. The fish is so light and mild and was encrusted with Macadamia nuts which are native to Australia. I added just a hint of garlic and citrus and it was outstanding. The slight smoky flavor from the cedar wraps was a perfect addition of flavor. (I found the cedar wraps at my local BBQ store.) In the Bush Tucker cuisine, the fish would have been wrapped in paperbark. Aboriginals have been using paperbark trees for years for medicinal purposes. The bark is chewed for headaches and the oil is used as an antibacterial and antifungal treatment. 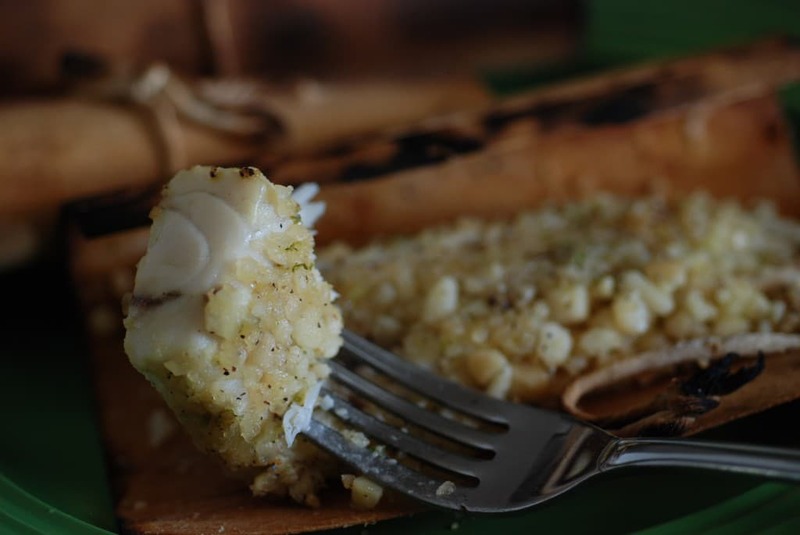 Paperbark would have infused the Barramundi with a similar smoky flavor, just like our cedar wraps. 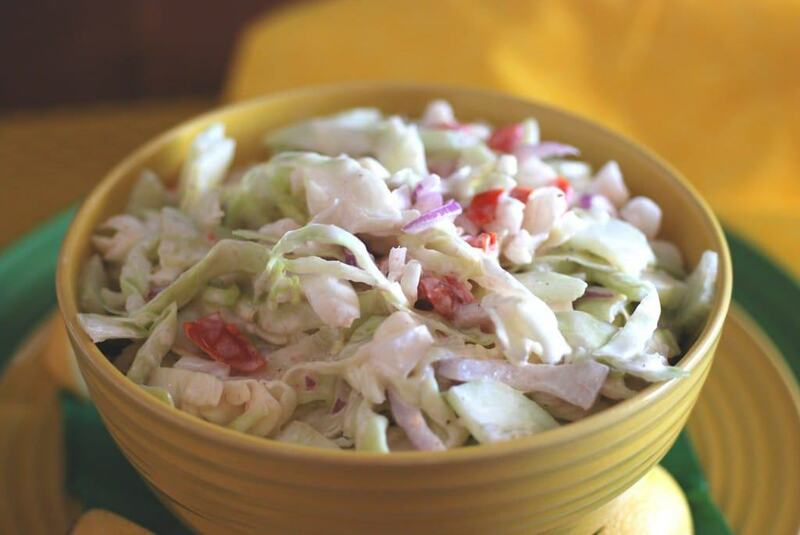 The Aussie slaw had tomatoes and cucumber which was a refreshing addition to your typical slaw. 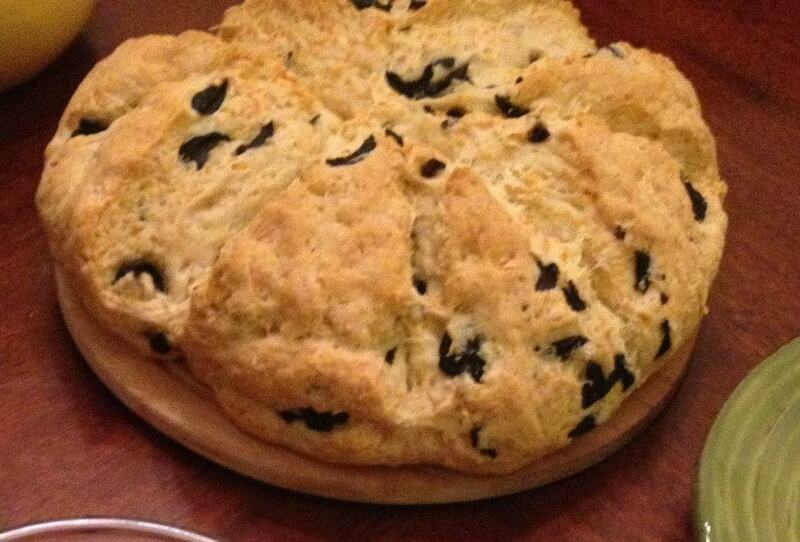 The damper bread was spiced up with some cheese and olives and was very tasty. Lastly, the Lamingtons, a surprisingly light sponge cake dessert that is delicious with its chocolate and coconut crust. The meal was served with a Lindeman’s Chardonnay Reserve. Australia is the fourth largest exporter of wine, so finding a good bottle to enjoy with your meal should be a cinch.